SSH is a great tool for using your VPS. This is a simple guide on connecting to your VPS with an SSH client. This is necessary for most VPS services, as many services do not come pre-installed with a VNC, which allows you to view the “desktop” of the VPS. Therefore, you must connect through SSH, also known as “secure shell,” which is a text-based shell session, allowing you to send commands to your VPS’s command prompt. 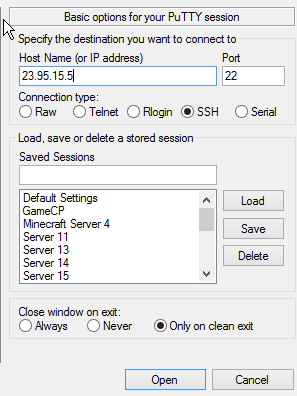 Enter the IP address of your VPS into the “Host Name (or IP address) field. The default port for SSH is 22, but if it doesn’t work, contact your host to see what the port is; some hosts may change the default port for your protection. 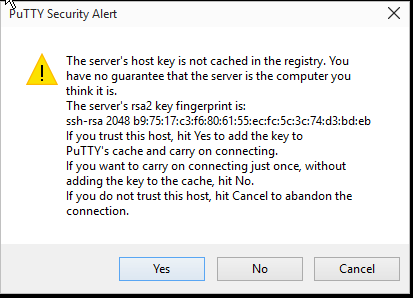 Click “Open” after verifying the IP and port are correct. You will now be prompted for a username; in most cases this will be root. Once you type the username and press enter, you will be prompted for the password. Enter your password (nothing will appear, but your keyboard will be typing) and hit enter. Congratulations. You’re now connected and run commands. If you’d like to install a desktop, we recommend looking up a guide on setting up VNC. hao to set up VPN? That’s outside the scope of this particular tutorial, we don’t currently have a VPN tutorial up, but we’ll definitely try to write more tutorials in the days to come. For now, you should look into an OpenVPN Access Server tutorial as it has an easy-to-navigate admin panel and still allows customization. I have purchase the VPS with Windows RDP from this Site. And I want to know that How to run this RDP in Remote Desktop Connection. Everytime I want to open VPS using Remote Desktop Connection by adding IP. Its giving me error. its not opening. Please help. Hi, you may need to edit the firewall rules and enable the “Remote Desktop Connection” Inbound Rules, once those are enabled RDP should work fine. However if you still need support with this, please open a ticket and we’ll help you out.